US, 2013, 107 minutes, Colour. Paul Giamatti, Paul Rudd, Sally Hawkins, Amy Landdecker, Tatyana Richaud. 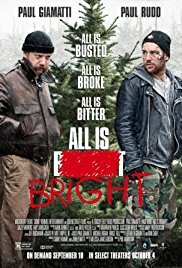 If one is looking for a Christmas film to enjoy, then this is probably not it – unless you are in a sardonic frame of mind and believe the title, All is Bright! The film has a Canadian setting as well as most of the action in New York City. He forces himself on to René who is working on a Christmas tree business, transporting trees from Canada to New York City. At first, sales are not prospering and there is rivalry from tree sellers from Vermont across the way. Dennis uses some bully boy tactics. However, there is some change when he encounters a Polish woman, Olga, quite a different style of performance by Sally Hawkins. Things begin to look up, René also develops a style, posing as French-accented, describing the trees imaginatively and gaining more custom. However, a blind man who wanted a tree, reappears and robs them. The main part of the action is Dennis’s decision to steal a piano from the home where Olga lives, she leaving a window open. He wants a piano for his daughter who plays with an artificial keyboard in her desire to play. They steal a piano, dismantling it, taking it back to Canada and putting it on the front lawn. And Dennis has to accept that life is changed for him, for his wife, for René and his daughter… And off he goes. Direction is by Phil Morrison who made an impact with Juno. 1. A Christmas fable? Canada? The US? New York? The downbeat tone? 2. The Canadian settings, winter, the town, homes, the tree business? The road to the US, the border? New York City, Brooklyn, the streets, the tree stall, the local businesses, Olga’s home and the interiors? Atmosphere? 3. The background of Christmas carols and Christmas songs? Jaunty background? Serious? 4. The focus on Dennis, Paul Giamatti, four years in jail, getting out, going home, looking through the window, his wife and daughter, the notices at the window, to keep silent, the news that he was dead of cancer? The glimpses of his daughter? His depression? The visit to the parole officer? Unable to get work? His antagonism towards Rene and his relationship with Thérèse? Going to confront him? The tree business, his deciding to go with him? 5. Therese, distance from her husband, care for her daughter, the daughter and her love for the piano keys? The relationship with Rene? 6. Rene, past criminal activity, letting Dennis down? With Therese? Divorcing his own wife, marrying Therese? Dennis forcing him to take him to sell the trees? The anger of the man whose job was lost? On the road, Rene incessantly chattering, Dennis and his irritation? The border, the search, Rene nattering, the gift/bribe of the tree? 7. New York, setting up, the rivalry from Vermont and Dennis attacking? Sleeping out, the trailer house? The trees, not getting any custom? Olga and her approach, the bargaining, Dennis delivering the tree, her welcoming him? His stealing the bowl? Pawning it? Olga aware of this? Dennis going back to steady the tree? Getting the money, the improvement in sales, the different ways of selling the trees, Rene and his Canadian accent, describing the trees, male and female, the growing custom? Dennis managing the money? His irritability with the little girl? 8. Olga, Polish background, speaking Russian, working with the dentist, playing the piano, buying the tree, the bargain, welcoming Dennis, his visits to the house, her coming down to watch the sales? Going to the piano store, her friend selling the pianos? Dennis scouting out a piano for his daughter? 9. The various people round about, the various customers coming to buy trees, the interactions? The man selling novelties on the corner? The blind man? The return of the blind man, his robbing them? 11. The piano on the lawn, Rene and to raise together, the delight of the daughter and her playing the piano? Denis watching – and going off? 12. An offbeat Christmas story?